V, a member of globally celebrated K-pop boy band BTS, has released a self-created song, “Scenery,” joining other group members in releasing self-composed songs. The new song was put up on BTS’ Korean blog Wednesday night for free download. V, whose real name is Kim Tae-hyung, composed and wrote the lyrics for the new music release. 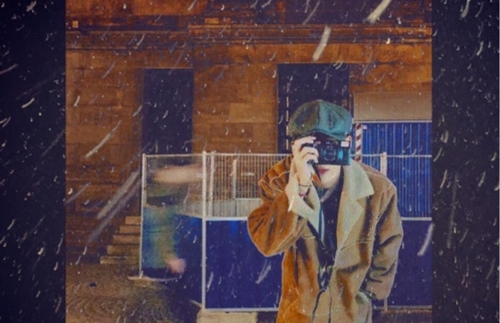 The song’s digital album jacket, a photo of V taking a selfie on a snowy night, was also created by V himself. It is the first song V created on his own, after he jointly composed the song “4 O’CLOCK” with BTS member RM and released it in 2017. V’s solo song vividly conveys his sentimental inner mind, alternating between Korean lyrics and an English refrain, which evoke tranquil scenes of a flower-lined way and a quiet park at dawn. V’s baritone voice adds to the song’s sentimental allure. V is the latest BTS member to release a solo song. Team leader RM released a package of his own songs, “mono.,” in October, followed by Jimin, who unveiled the self-composed single “Promise” in December.